Check out the latest CAUSEBOX News on My Subscription Addiction! Last Day for CAUSEBOX Summer Box #2 + $15 Coupon! Last Call to Sign Up for the Summer 2018 CAUSEBOX + Coupon! CAUSEBOX Summer 2018 Box Customization Added + Coupon! CAUSEBOX Summer 2018 Box Spoiler #1 + Coupon! 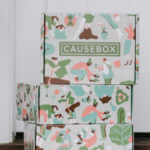 CAUSEBOX Summer 2018 Box – Available Now + Coupon! CAUSEBOX Limited Edition Earth Week Box – Available Now + FULL Spoilers! Weekend Giveaway: Win the Spring CAUSEBOX + A “Best Of” Box! CAUSEBOX Spring 2018 Box – Available Now + Coupon! Last Day for CAUSEBOX Coupon – FREE Mystery Box with Subscription + 12/23 Delivery!